The Shean Competition for Strings and Piano, made possible by a generous grant to the Edmonton Community Foundation from Ranald and Vera Shean in 1996, is open to young amateur musicians between 15 and 28 years of age who are residents of Canada currently studying here or abroad, or to non-residents who have been studying in Canada for a minimum of two academic years. Six semi-finalists are chosen from the submitted discs. The winner of the Competition may be invited to perform with the Edmonton Symphony Orchestra at a later date. Strings and piano are featured in alternative years. Ranald Shean excelled in both music and sports and was a “Master Music Teacher”. Vera Shean was an equally gifted violinist and pianist. They met in Vancouver where Ranand was an associate teacher with Gregori Garbovitsky’s and Vera was Garbovitsky’s piano student. She also completed advanced piano studies with Sir Arthur Benjamin. Ranald & Vera married and began a lifelong collaboration in music, predominantly in the Edmonton area. In the 1940’s, Ranald was concertmaster and conductor of the Edmonton Symphony Orchestra. In addition to playing violin in the Symphony, Vera performed in recital and as an accompanist for the CBC, and Ranald also conducted the Edmonton Youth Orchestra. In 1966, they established the Edmonton Conservatory of Music which later merged with the Alberta College Conservatory of Music. Their passion was teaching. 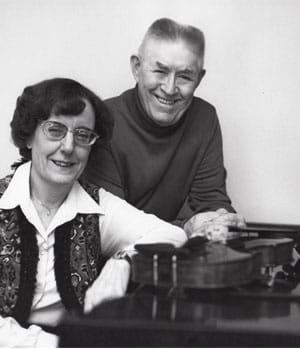 During their lives, they both maintained a full teaching schedule (Vera – piano, Ranald – violin) working seven days a week. Sunday was “Open House” for their students. Any student who wanted to come and practice, work with an accompanist (Vera), have extra coaching, play in an ensemble, etc. was welcome. Both Ranald and Vera were elected to the City of Edmonton’s Cultural Hall of Fame. Their dream for young musicians to experience the same passion they had for music, lives on in The Shean Competition. 2014 Shean Piano Competition Application form & Brochures are available on the piano download page. The winner of the 2010 Piano Competition was Scott MacIsaac! We received 23 applications, and have selected our competitors.